I was going to start out this article with the phrase “As we live in an increasingly sophisticated world,” but suddenly found myself stopping in mid-sentence. Technology changes the way society functions, and often changes the balance of power. Technology changes the way we live our lives, the way we do business, the way we fight wars, the way we govern, and certainly the way I do my job, but I’m not at all sure it makes us more sophisticated. As a licensed private investigator, I deal a lot with both privacy issues and technology. Public and private sector entities we depend on for information are in a constant state of flux. Government authorities around the world are building super-tools to track perceived threats against them. Data mining and cyber-warfare tools are being built faster than courts and politicians can figure out the difference between email and texting. Online merchandisers are building super-tools to increase sales opportunities, and those who attack authority are developing their own technological tools to wield in the struggle to hold the digital high ground, a fascinating balance of power. Today, government entities are wielding surveillance tools that are so powerful they have no historical precedent. At the same time, adversaries of governments have become more nimble and adaptable too. Which brings us to today’s window on the world of technology. In tech battles, the advantage often goes to the attacker. When malevolent actors in places like Afghanistan attack authority, creative melding of technologies turns the advantage to the attacker. Like recombining old cellphones and unexploded munitions and turning them into tank-killing IED’s, cheap and easy technology can serve to help us annihilate each other. Once in a long while, however, someone comes up with an inspirational marriage of technology that helps us to not destroy one another. Today’s find was one of those unlikely marriages. Civil Rights Defenders, a Swedish NGO, (http://natalia.civilrightsdefenders.org/#how) has introduced the Natalia Project, a marriage of existing technology that actually makes it harder for evil people to get away with violence. In high risk parts of the world, human rights advocates are taken in the middle of the night when no one is around. 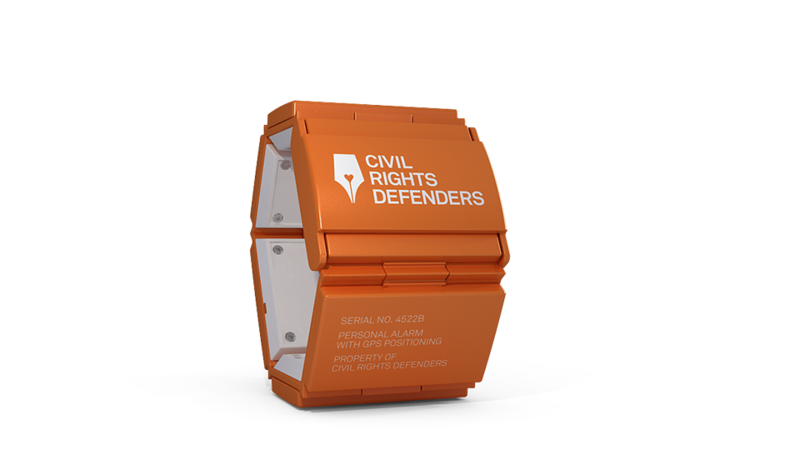 Civil Rights Defenders took the social networking of a twitter feed or Facebook page, and the geolocation technology of a GPS offender tracking system, and melded them together. The resulting technology is an alarm device for human rights defenders. Activists, journalists, and others at risk of abduction, murder, or being taken as a political prisoner latch the device, a clunky orange bracelet, around their wrist. When a human rights defender realizes he or she is being attacked, they activate the unit by pushing a button. Like a silent alarm from a bank to the police, once cut open or triggered, the wristband sends out a signal. That signal will hopefully hit a cellular or wireless network, sending an SMS text message back to Sweden and sounding the alarm to network members in the area, along with the wearer’s GPS coordinates. The idea is that through notification and mass media, midnight assaults against human rights defenders become increasingly risky to the aggressors, especially if someone with a video camera can get to the incident quickly. Initial distribution of the device began in Stockholm on April 5. The devices are not for sale to the public. They’re looking at having the devices on 55 at-risk civil rights defenders by the end of the year, many of whom are in former Warsaw Pact or Soviet states.